Good packing is essential and one of the most overlooked aspects in moving. Your fragile and specialty items need to be well packed to ensure they are protected during the move itself and will survive unscathed. 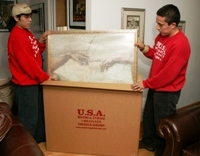 At Chicago-based USA Moving and Storage, we can provide you with the materials necessary to pack your items safely, from the smallest vase or glass to wardrobes and art. Let our trained professionals handle the packing for you as well as disassembling and reassembling of furniture and more. Your personal Chicago movers will work with you to answer any questions and to be sure that all packing needs are met with care. If you choose to do it yourself, please remember not to overload boxes. Pack and mark fragile items and their boxes well. Also, please label all boxes with the room destination for quick unloading in your new home. This will help to direct the movers to the correct room without delay. Click here for some helpful hints and ideas on how to help make your move as smooth as possible.